This is quite probably one of the fastest and easiest pools to get set-up and ready for use. This particular pool is a mid-size pool that is 30 inches deep and approximately 12 feet in diameter. You can find pool maintenance kits here. 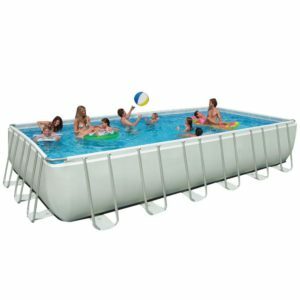 Although it is primarily designed for small yards and families with small children, The Intex Easy Set Pool packs a lot of summer fun into a fairly small package. You can fill it up with a garden hose, and it’s also very easy to drain when you’re finished swimming and getting ready to store it for the winter. This Easy Set Above Ground pool Kit will typically come with an instructional DVD, and Pool Filter Pump. 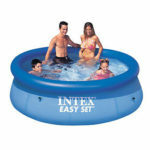 The Intex Easy Set Pool can be purchased in several places. You can find them on Ebay, and you can also find them on Amazon. These inflatable above ground pool kits are absolutely brain dead simple, All you have to do is inflate them, Fill them, and enjoy them. 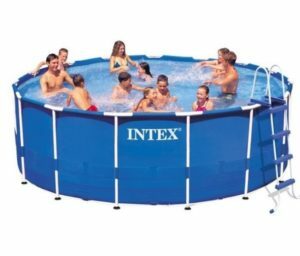 The Intex Recreation Swim Center is another inflatable pool that is designed for small yards and again, families with small kids. This pool has two air chambers to inflate and is easy ti fill and drain when you’re done with it for the season . You can repair these pools with a vinyl patch kit, similar to the way you would repair a bicycle inner tube. Simple to set up, simple to take down, and simple to enjoy. This is a fairly large pool, But still only takes about 20 minutes to set up with just a couple people. 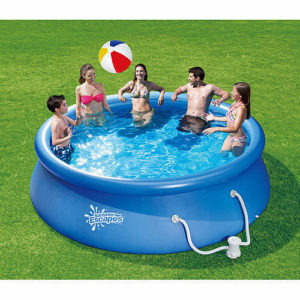 You can get about seven people in the pool at one time, so finding some help to set it up should not be very difficult. This inflatable above ground pool will hold about 1000 gallons of water. It takes up a little more space but is still very easy and quick to get set up. This above ground pool kit comes with a filter pump, a Ladder, a repair kit and more. Again, You can purchase this pool kit at EBay, or Amazon. These above ground pool kits are a bit larger, and will take up a little more space. With that being said, they are still very affordable and easy to set-up as well. The Intex Metal Frame Above-Ground Pool will come with a 120-volt filter pump and a ladder that makes it easier to get in and out of the pool. The filter pump is a pretty hefty pump, it is rated for about 2500 gallons per hour. These pools can be purchased at either Ebay or Amazon whichever you prefer. Intex Pools are some of the best Above Ground Pools available. With different sizes and styles, they have earned a great reputation for quality and durability. 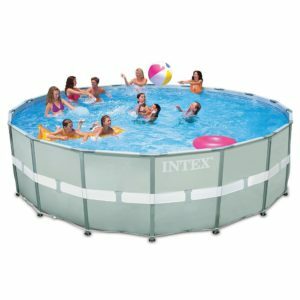 The Intex Pools come very well packaged and are easy to get set up and ready for water. Even if you have to do it by yourself. They tell you that you can have them set up in about an hour, But after reading a ton of positive reviews about this pool, I find that a better real-time estimate of set-up is probably closer to two hours if you’re working alone. This Above Ground Pool Kit is engineered for strength and durability. The parts are well made and fit together with ease, Making set-up a breeze. You can get yours from Amazon Here, or read positive reviews of the pool set here. This pool is 12 feet wide by 24 feet long and measures 52 inches to the top of the pool frame. A super duper durable above ground pool kit that, like all of the other Intex Pools, is designed to last a long time. The sidewalls of this pool kit are made of a super tough laminated PVC . I won’t tell you that it is impossible to poke a hole it, but I will tell you that it’s going to be difficult, even if you try. Please visit Amazon for more in-depth product info. and read product reviews to help you decide if this is a pool kit that will work for you. This is a Big above ground pool. This pool is one that I would set up and build a deck around it, and leave it up all year long. 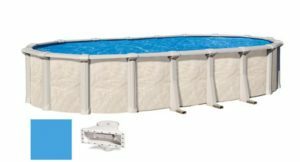 With this above Ground Pool Kit, you’re not buying a pool that has been pieced together with parts that are made all around the world. You are buying an American made pool that is built to last. This could actually be considered an investment, as it will most likely up the value of your home. With the right pool cleaner and the right pool accessories, this swimming pool will be a source of summer fun and enjoyment for years to come. With stainless steel bolts and fasteners, you won’t have to worry about rust spots on your pool liner, and the interlocking stabilizing rails will hold your liner in place and extend the life of the pool liner. With proper Pool Care and maintenance, this above ground pool will last you twenty years or more.